No time for anything other than family, the Ogs and work, although does occasionally socialise. Pat, and indeed the rest of the Rice family, is Eire Og through and through. Eire Og has been Pat’s only club and without the likes of him and without his hard work and enthusiasm the club probably would not be where it is today. Pat played first game at age 10 in a minor football match against Mitchells at McRory Park (1966) and his first Senior game at the tender age of 13 in a South Antrim Football game against Clonard in Falls Park. A footballer and a hurler Pat has won nearly everything for both Eire Og and his school St Mary’s CBS. At St Mary’s Pat won an All Ireland Colleges Hurling medal and four Ulster Colleges Hurling titles. He also played County Minor Football for three years, losing to Derry in the Championship semi-final in 1973 who went on to win All-Ireland. He has only one Senior football call-up - reserve in a Dr. McKenna Cup match against Down in 1975. For the Ogs Pat has won an Intermediate Football Championship, 2 Junior Football Championships, 2 Beringer Cups, 2 Martin Cups, a Junior Hurling Championship and various league titles, both football and hurling, as a player and also as a manager. He also captained the Minor team in 1974 and once or twice captained the senior team too. 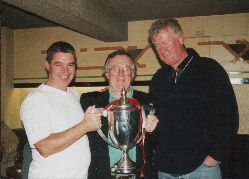 Winning the Intermediate Football Championship was perhaps the highlight of his club footballing career. Losing an Intermediate Championship final to Moneyglass was perhaps the biggest disappointment, although never playing in Division 1 of the All-County League comes very close - finished as runners-up in Division 2 on three occasions. Also losing the Minor Championship final to St. John’s in 1974 also still hurts. Pat recalls watching Antrim take the field in 1989 All-Ireland Final as a real highlight, but on a more personal note his all-time highlight was winning All Ireland Colleges Hurling with St. Mary’s in 1974. Pat also regards wearing the saffron jersey in Ulster Minor Championship as an honour and he always felt very proud when taking to the hurling pitch alongside his three brothers. His best match was when he scored 11 out of 13 points in ACFL Division 4 game against McDermotts. Eire Og won the match 0-13 to 0-12. Pat played hurling and football for Eire Og since 1966. He retired from football about 9/10 years ago and worked with Junenile teams for about four years. He became manager of Senior Football Team in December 1999 for a second stint. He won the Junior Championship in 2001 and gained promotion to Division 3 of ACFL. He has 3 sons and a daughter who are currently playing with the club at various age groups and intends working for the club for as long as it wants him.